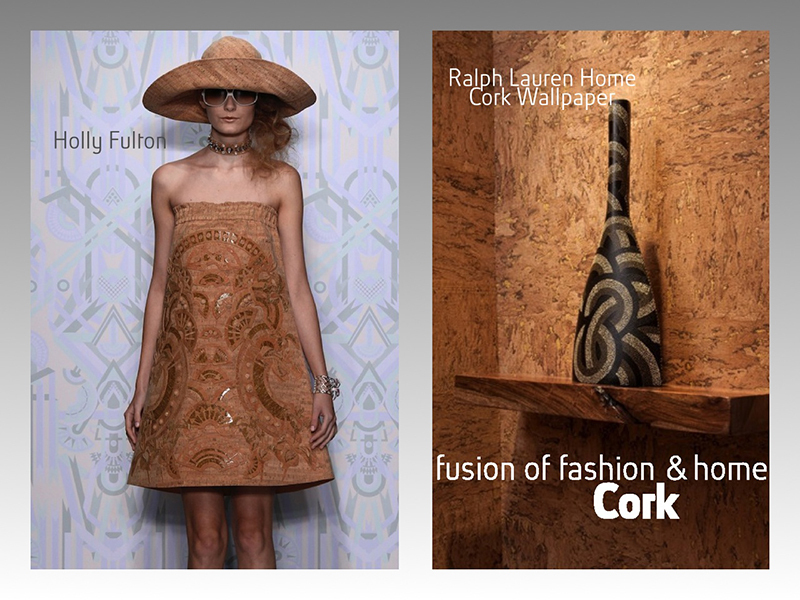 Cork is quite possibly one of the better materials for any type of creating; fashion and home included. Oak trees that grow in the western Mediterranean form thick, rugged and corky bark. Over time, this park can develop a considerable thickness and can be harvested every 10-12 years as cork. The harvesting of the cork does not harm the tree, and the a new layer of cork regrows, making it a renewable resource. This entry was posted in Blogs, cork, creativity, Design, Design Works International, Designer, Designer Fashion, Fashion, Furniture, Fusion, HGTV, HGTVHome, Nancy Fire, Product Design, Trend Blogs, Trend prediction, Trending, Trends, Uncategorized, Women's Fashion and tagged cork fashioin, cork wallpaper, Design, Design Works International, Designer Fashion, Fashion, Fusion, HGTV, HGTVHome, holly fulton, Home, Interior Design, Nancy Fire, Oak trees, Product Design, ralph lauren, Textiles, Trend Blogs, Trend prediction, Trending, Trends, western Mediterranean, Women's Fashion by Design Works International. Bookmark the permalink.